Tapered legs don’t sound all that difficult. Honestly, once I got things set up it was very straight forward. 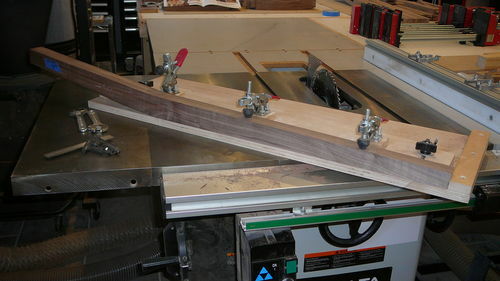 The plans for the Kevin Rodel side chair call for tapering the upper section of the rear legs from where the chair rails connect to the rear legs up to the top of the leg, about 25-1/2”. It is a very subtle taper on the outside edge, from 1-1/2” to 1-1/4”. As usual though, there is a catch, the leg has a 7 degree bend in it which means the right side leg can’t be put on the taper jig in the normal orientation. First the left side; I set the fence to 1-1/2” at the 25-1/2” mark on the leg. If you look at the picture, the mark on the side of the jig isn’t correct. It should have been where the mark on the side of the leg meets the jig. The fence was set to 1-1/4” at the bottom stop. 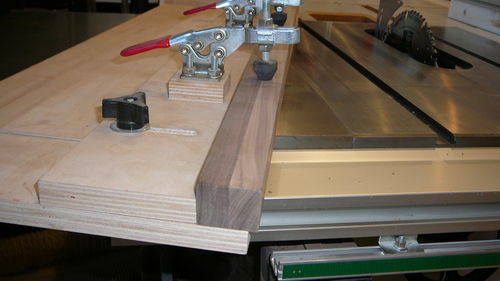 All of the clamps were adjusted to hold the piece tightly. If you notice, I use the fence as a guide for the taper jig rather than installing a guide strip to fit in the miter slot. 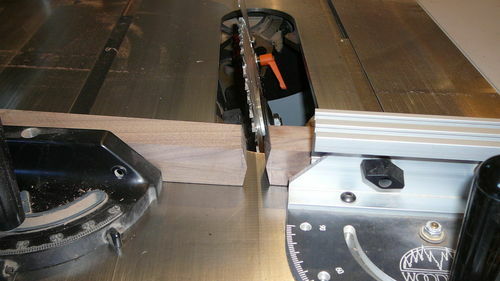 That is because the miter slot doesn’t extend far enough into the outfeed table for me to be able to push it through the blade. Also notice that I removed the zero clearance insert. The blade had to be raised so high that the stiffeners were hitting the bottom edge of the insert. Needless to say, with the blade raised that high and no plate over the opening, I was EXTRA careful watching where everything was before, during, and after pushing the taper jig and leg through the blade. After all of the left legs were cut (another reason for marking everything) I switched over to the right legs. 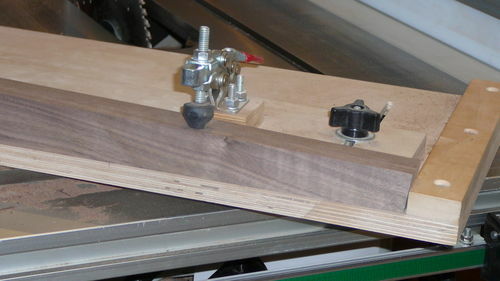 I set the fence at 1-1/4” at the very top of the jig and set the fence to 1-1/2” at 25-1/2” down from the top. With the leg not butted up against the rear stop, the clamps were all that held the piece from sliding backwards as it was cut. My back up plan was to add some psa sand paper to the jig base to provide a little more friction if the piece slid back. Fortunately, it was a thin cut so it didn’t move. After the success with the tapers I moved on to the pyramids that top the front legs and the tops of the rear legs. Since I wanted a softer, rounded over pyramid on the front legs, I set the miter saw to 11.5 deg (preset notch) and made the tapered cuts. There were a lot of saw marks which meant more sanding. By the time I finished, they were definitely “softened” pyramids. That is OK, as I don’t relish the thought of having a sharp point poke my leg every time I move on the seat. The rear legs were much more challenging. 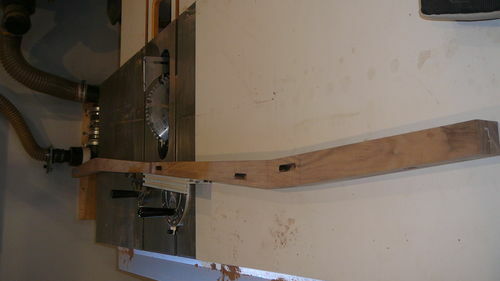 I started out by matching the angles with a miter bar on either side of the blade. The blade was tipped to 11.5 degrees as well. The piece was flipped to the other side of the blade for the second cut. 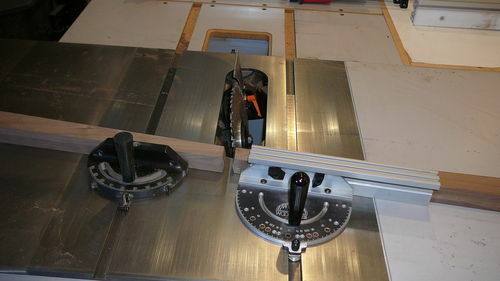 The other 2 sides of the taper were finished on the miter saw using the 11.5 degree setting. I’m not sure that the sides of the pyramid really were consistent, but I did manage to get the point in about the same place on all of them. Again, sanding them rounded the edges considerably resulting in a “softened” pyramid. I did try making the pyramid using the belt sander and it did work OK but there were still plenty of scratches to sand out. Grandpa Doodie provided a method for getting the pyramids just right so look at his blog if you want to do a better job than I did. 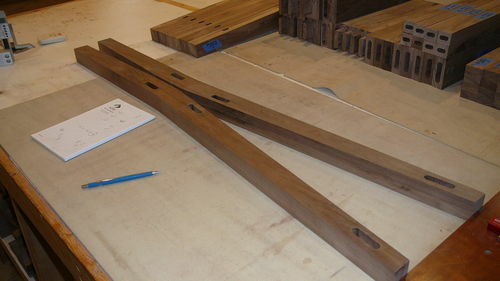 The cross stretchers are all that is left except for the final assembly and glue up and some decorative square plugs. Thanks for making my Sunday morning coffee break! Good blog. I like all of your processes except running the tablesaw without an insert. Hopefully you can find a way around it next time. The chairs are going to look great. Earl, you’re making excellent progress. Pinto – got any better ideas for something that tall? I don’t think I could have reliably run it through the bandsaw. Maybe I could have made a router template and went that route. I guess there is always a safer way if you think for a bit. 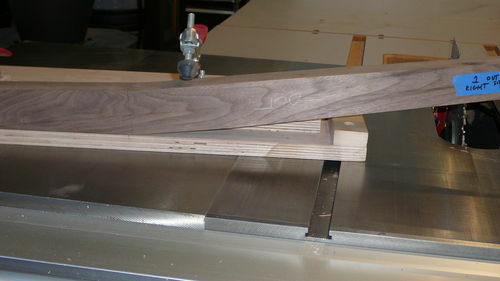 About half way down this blog post I show my method for cutting angled pyramids on leg tops. It involves an oscillating belt sander though, so unless you have access to one it may not be helpful. 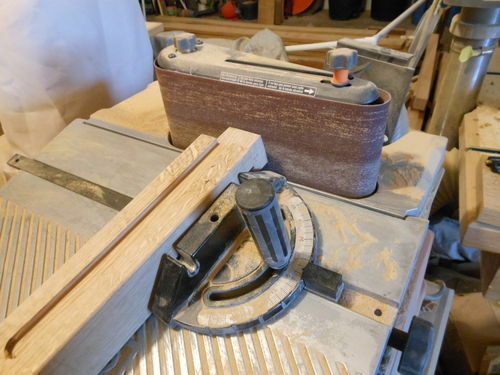 It sure does make buttery smooth angles, and has become my preferred method for shaping through tenons. Willie, Thanks for the link to your blog showing how you approach pyramid ends. 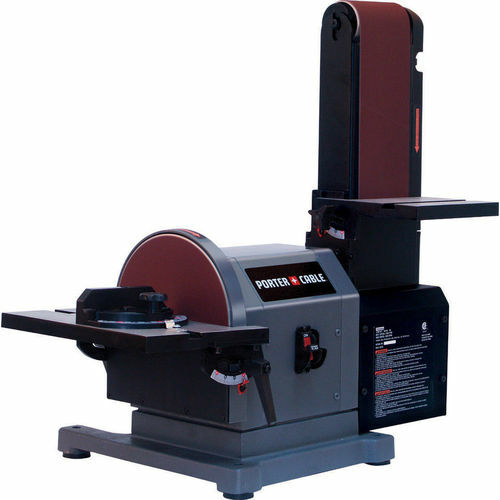 The belt sander I mentioned is a Porter Cable belt and disk sander. It made the pyramids, but I rounded them over considerably with the 320 grit final hand sand. I like the rounded over pyramid look more than I do the well defined sharp pyramids. I also just finished reading through your Morris Chair blog – great blog detailing your fine craftsmanship. I’ll be referencing it when I get to the G&G Morris chair I want to build one of these years…..